The California court overseeing the appeals process for Samsung's recent $1 billion-plus loss to Apple ruled on Thursday that Apple's head of worldwide marketing must make himself available for more questioning by Samsung lawyers. Whom is that particular witness? 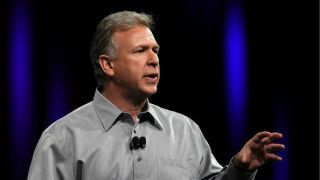 None other than Phil Schiller, who testified during the four-week trial in August. Both Apple and Samsung will get the opportunity to interrogate numerous expert witnesses over the weekend. The depositions were ordered on Monday, but Apple spent the week in part arguing that Schiller is not an expert witness, and can only comment on facts, not provide an expert's opinion. Magistrate Judge Paul Grewal shot down that notion Thursday, writing, "Clarification of the court's Oct. 29 order is what Apple wants, and so clarification Apple shall get. "No later than Nov. 5, 2012, Mr. Schiller shall appear for three hours of deposition. It is so ordered." Schiller will have to make himself available to Samsung's lawyers outside of a courtroom before Monday. Luckily for him, the interrogation can't last longer than three hours, though they'll no doubt make good use of that time. Computerworld pointed out that Schiller provided some of the most entertaining testimony in the original Apple vs. Samsung trial, touching on topics such as how Apple conceived of the iPhone and iPad. At the time, Samsung's lawyers questioned Schiller for more details about the devices' designs, as well as emails on which he was CC'd that reportedly showed proof of Apple copying features from existing devices. Naturally, Samsung wasn't too pleased with the court's decision to award Apple more than $1 billion. For its part, Apple wasn't happy either; the Cupertino company actually wanted more money, and as of September was seeking an additional $2 billion. The appeal hearing will begin on Dec. 6, and while either company could come out on top financially, both have lost enough face that each should be questioning whether this dispute is worth sustaining.